Located in the heart of Tewantin, Noosa Caravan Park creates a relaxing sanctuary at the centre of a cosmopolitan playground. Beautifully secluded, they offer a wide variety of accommodation, from their stunning palm lined powered caravan and camp sites to their self-contained Villas. Campsites have access to their first class facilities including spotless amenities, laundry, camp kitchen and barbecue areas. Their Villas range from basic Ensuite Cabins to their two and three Bedroom Villas, which feature a fully equipped modern kitchen, well appointed bathroom, comfortable lounge and verandah with a lovely outdoor setting. Set in a beautiful landscaped setting with grassed areas, Noosa Caravan Park also offers a wide range of facilities including heated swimming pool, covered barbecue area, free wi-fi (first 24 hours up to 100 megabytes), child wading pool, camp kitchen, television/lounge area, pool table, children's playground, kiosk, tourist information and laundry. Noosa offers an amazing diversity of attractions ranging from the natural beauty of the stunning beaches and tranquil rainforests to the sophistication of the renowned Hastings Street strip and some of the world's best restaurants. 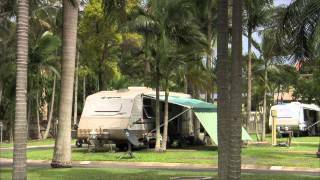 Whatever your pleasure, Noosa Caravan Park at the heart of the Sunshine Coast, is the ideal place to enjoy it. All sites are powered with the option of a slab or grass site. Slab sites are suitable for a 25 foot caravan, annex and one car (for vans over 25 feet please call them). While grassed tent sites provide room for a two room tent and awning and one car. The Deluxe Two Bedroom Villas offer the best in cabin accommodation, comfortably sleeping up to six people. Ideal for a family, the master bedroom comprises of a queen bed (linen supplied) and the second bedroom of two bunk beds. The Villa has a fully equipped modern kitchen and a well appointed bathroom. Television and DVDs can be viewed on comfortable lounges, or just relax on your outdoor setting. The Deluxe One Bedroom Villa offers luxury cabin accommodation, comfortably sleeping up to three people with a queen bed in the master bedroom, and a sofa bed in the lounge. The kitchen is modern with hotplates and microwave and the bathroom is well appointed. Villas are located right next to a lovely barbecue area. Television and DVD can be viewed on comfortable lounges and you will love the outdoor setting. Unwind and relax in their comfortable One Bedroom villas, which sleep up to four people. The Queen bed comes with all linen included, while extra guests will be comfortable on the two single beds. The bathroom has a toilet and shower, and the kitchen is fully self-contained. Air conditioning and ceiling fans will ensure that you will remain cool with while you are being entertained by the television and DVD, or lounge back on the outdoor setting and let your worries drift away.